Cool old-school theme, bonus features, free spins, AND progressive jackpot. Playtech, please stop, you’re killing us. Pink Panther slots are nice, proven by years, tested by millions. Nuff said. Pink Panther slots were created by Playtech, who are famous for their licensed video slots. Of course it’s made in the style of the original cartoon, and tries its best to bring some of the signature humor to the reels. The games looks and feels nice, with familiar characters, nice animations, and classy soundtrack. More importantly, it also offers a shitload of bonus features, and two jackpots. All of those features are triggered randomly thought, which is kinda lame. The only special symbol to look out for is the Panther himself, who fills the role of wild. Remember we said about a shitload of bonus rounds? We weren’t kidding - there are six of them in Pink Panther slots. Some of them are simple, like several symbols suddenly turning into wilds, or a couple of spins on the Wheel of Pink. Other possible options include Crack the Pink Code, where you open safes and reveal free spins with a chance for a multiplier or expanding wild; Color Pink bonus (paint the wall, and the more numbers on it turn out pink - the higher your win); Pink Trail (follow the tracks as the inspector, with each next step increasing the wins, but also adding a chance to fall into a trap); and of course the Jackpot Adventure. If you’re lucky enough to activate the Jackpot bonus, you are guaranteed to get either one of the two jackpots, or a consolation prize. You’ll see 12 doors. Open them and reveal hidden characters - 5 Panthers will give you the highest jackpot. 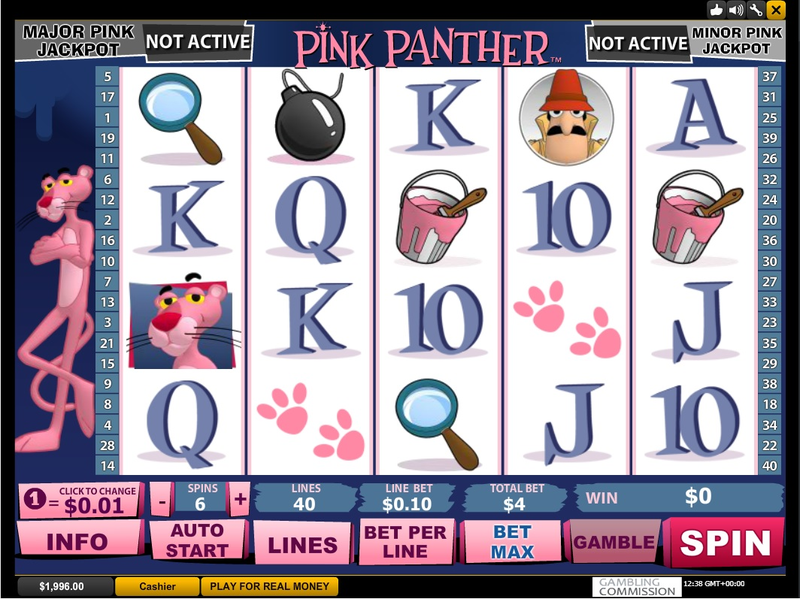 Pink Panther is a cool-looking video slot from Playtech, with numerous features, and a progressive jackpot. Go get that diamond, and drop an anvil or something on the inspector while you’re at it.